This tutorial teaches you how to save GrADS output onto an already existing image, a basemap. 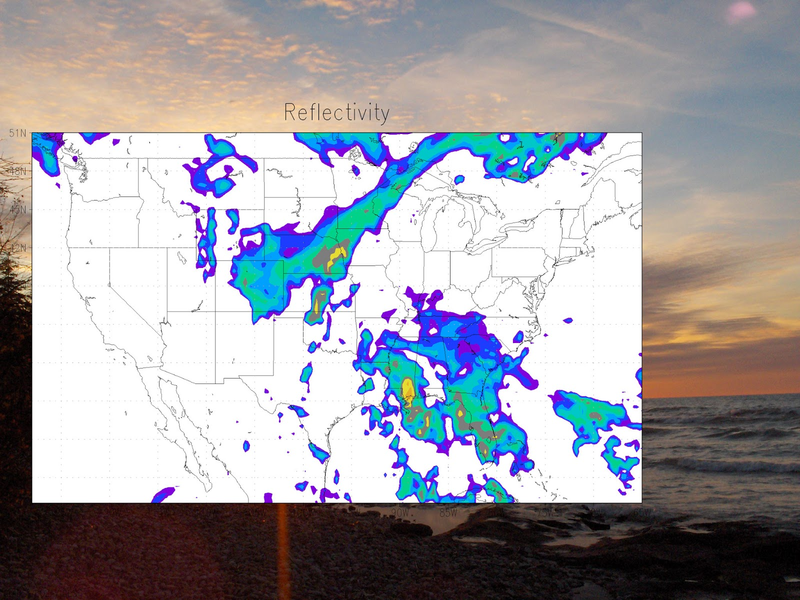 This allows you to bring more color and vibrance to your weather map by adding, for example, topographic maps underneath of your weather data. The use of basemaps can transform the image on the left to the image on the right. Before we get started with the tutorial, it is recommended that you learn how to make your own basemaps (see tutorial on making basemaps here). However, if you want to skip learning how to make basemaps for now, I will provide the basemap needed for this tutorial. The basemap provided will be the same basemap used in the above example. To download this basemap to your computer, simply right click on the image below and choose "Save Image As..." and save it to your GrADS folder. So, now that you have your basemap, lets get started. Plotting data onto a basemap is very simple, and requires very little extra code. All you need to do is add a few extra options onto the 'printim' command, when you are outputting your data to an image. The options -b and -t, respectively, stand for 'basemap' and 'transparency'. After the -b you must indicate the path to the basemap image, and after the -t you must specify which color to make transparent. You can find out this number by querying the shading information through the 'q shades' command, or simply specifying this number through the 'set ccols' and 'set clevs' command. And that's pretty much all there is to overlaying your data onto a basemap. Now, that you have an idea on how to do it, here are the correct dimensions for the basemap provided here. That about does it for this tutorial, you should now be able to overlay images onto preexisting basemaps. And just for fun, and so you know, your background image does not necessarily have to be a map. I hope you enjoyed, and found this tutorial useful! I'm plotting my snow maps above a background image of europe, but when there is no snow being calculated by the model, my background image turns white (so the color background isn't visible). 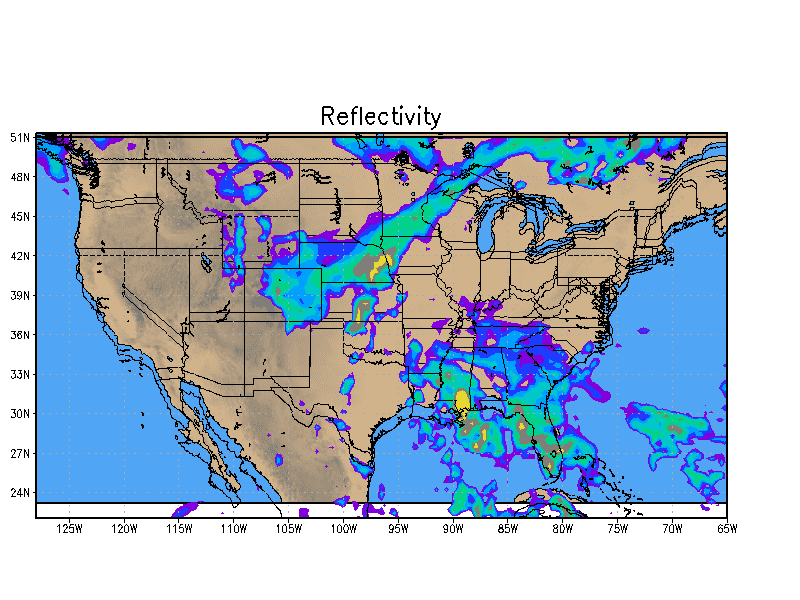 Is there a special code for getting back the color map, even when there is no snow being calculated? Two things to check, make sure that you set your contour levels ('set clevs') and your colors ('set ccols') Also, instead of setting the lower level of snow to zero try just above zero (like 0.01). Then the last thing is to make sure that when you use the 'printim' command, you specify your transparent color (-t) to the color marked at your lowest contour level. 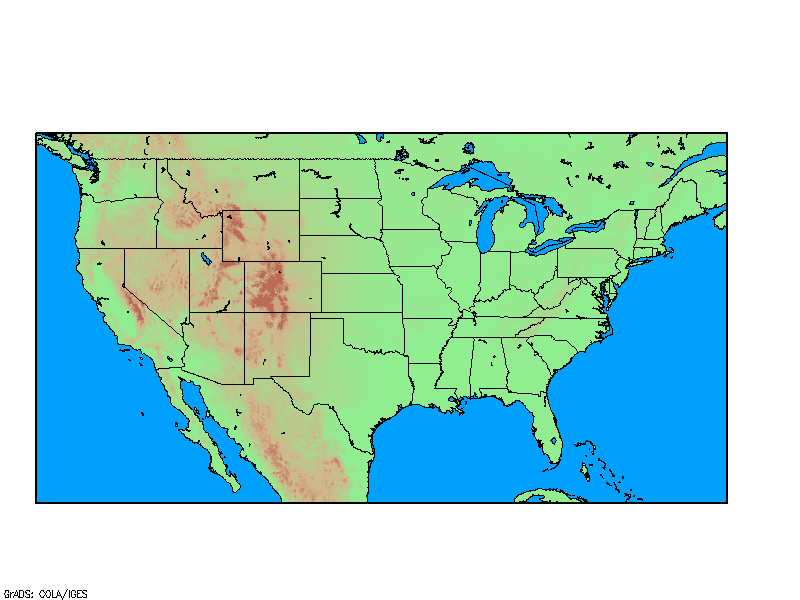 This way, any snow value lower than 0.01 will be assigned a color with the numeric value 0, then when you plot the image on your basemap, any colors with the numeric value 0 will be masked out. I downloaded the script provided above and changed the last line in the script to reflect where I wanted to place the image output, the name of the file and the directory to where the basemap/overlay image was located respectively (after the -b). What is it that I am doing wrong? This is on a linux operating system, if that helps. The problem is simple, GrADS cannot find your background image, so double check your file path to the background image. If you are using a linux system, you may need more in front of the /home/ to get the full file path. Go to the folder with your image and type 'pwd' into the terminal, this should give you your full file path. 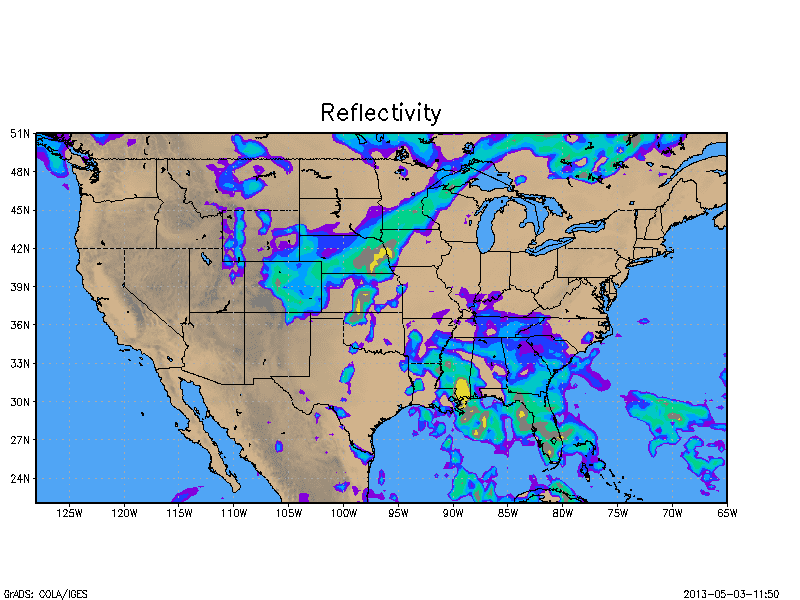 So, If you have the reflectivity data, either from a radar or model output, this isn't hard. There are a few tutorials here that can help you out. 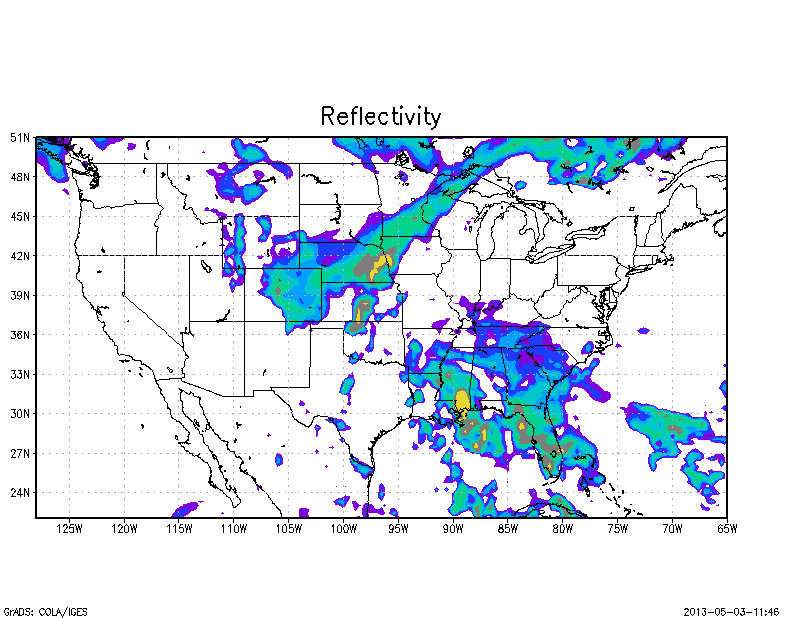 If you want to "calculate" a reflectivity estimate given other data, then I am afraid I can't help. Sorry I couldn't be of more help, I am unfamiliar with how to access data in Europe. I would like to make an ASCII file similar to lpoly_US.asc which I can use to mask out areas that are not within East Africa. How can I make such a file? Is there anyone that has an opoly_hires.asc and lpoly_hires.asc for africa? Hello! I'm learning grads and wanted to let you know how awesome this site of yours is, it has taught me a ton of stuff already. I have one question... I am trying to plot grads data on a basemap using your colormaps script. I tried picking colormaps colors (for example 's3pcpn') that began with white and then put -t 0 in the printim command like shown above, but all I get is the shading with no map background whatsoever. Any advice? Hi Charlie, so I am pretty sure I know what your issue is but without the code in front of me I can't be 100%. So I'll give you a quick answer here, and then if that doesn't work send me the code and I can look at it more in depth. So the way I set up colormaps.gs is similar to how color.gs is set up in that the assigned colors don't overwrite the 16 default colors that GrADS uses. So, the first color in any map is numbered as "16", therefore the white color in the s3pcpn is number 16, not 0. My guess is that is you change the -t 0 to -t 16, you should fix the problem. Okay, I looked at your code and I have one other thing you can try. Try setting the minimum value of CAPE in the colormaps call to be 5 or some other low value instead of zero. What I think is happening is the code sets everything BELOW the minimum value to 16, and everything equal to the minimum value to 17. Since the minimum value of CAPE is zero. If that doesn't work I'll dig around a bit more. Unfortunately, that didn't work either. One note I forgot to add: I can still see axes labels from my basemap with color.gs or colormaps.gs enabled (with -t 1) but can't see the topography on the basemap. I figured it out! There were two white levels, one at 1 and one at 16. Thanks for your help, and thanks for writing such an easy-to-understand and useful blog.